On a recent trip to California I hadn’t planned on doing any restaurant reviews as I didn’t want the blog to start turning into a travel blog, I wanted it to stay all about the food. However, I visited a couple of restaurants where the food was so good, it’d be criminal not to share them with you. 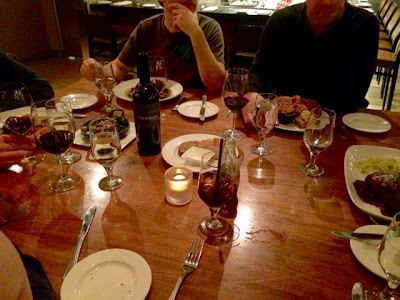 The first of which was Scratch in Mountain View. A very stylish restaurant with a huge bar the atmosphere is lively and buzzing, this is clearly a popular place. Where we get a lot of ‘modern British’ food in London, I guess you could describe Scratch as modern American. With classics such as ribs and of course a house burger on the menu, there’s also a few more Mediterranean inspired dishes, a raw bar and plenty of fresh seafood. I was designated driver on the night but there’s also a great wine list. 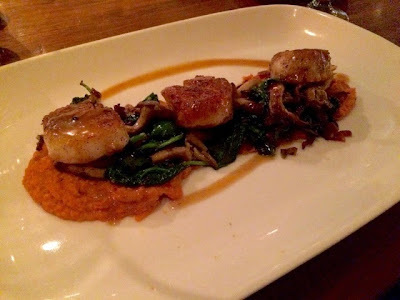 I ordered the pan seared sea scallops which came with a sweet potato and smoked jalapeño purée, spinach, bacon and mushrooms. Often with scallops everything else on the plate os very stripped back to allow the seafood to become the star so I was intrigued that there appeared to be so many strong and exciting flavours going on in this dish. The scallops were perfectly cooked, not chewy and not raw in the middle, just as they should be and tasted so delicious and fresh. The sweet potato purée complimented them well and partnered excellently with the spinach and bacon. One of the real stars of this dish for me though was the mushrooms, they didn’t outshine the scallops but they had such a rich earthy flavour and a good bite to them that they were definitely a memorable feature. Overall, excellent service, a fun atmosphere and really knowledgeable staff. We asked several questions about the menu, all of which were answered thoroughly and helpfully, I’d definitely head back to Scratch as I’d love to try more of the menu. The fresh fish of the day and the roasted lamb sirloin were two dishes in particular that several of my friends raved about. A short but sweet review as I only had one course but I’d definitely recommend Scratch goes on your to do list if you’re in the area.